Welcome to the Essex County Department of Social Services website. Please click on a link below to find information about that program, or click on a tab. The Accounting Unit is responsible for a variety of financial functions for the Department of Social Services. The Social Services department has one of the largest single-department budgets in the county. Approximately 60% of social services expenditures are reimbursed by the state and federal government, but with continuously changing and complex claiming rules, maximizing these revenues requires constant vigilance. We track all grants and allocations to gain as much reimbursement as possible, without overspending. We also track all DSS contracts to be sure all financial requirements are met, and that contract payments stay within the expenditure limits and time frames. The Accounting Unit has primary responsibility for accurately tracking all DSS expenditures, and submitting monthly claims – using 29 to 39 different forms – for reimbursement of funds from the state and federal governments. We process all of the administrative payments for DSS. In addition, we prepare some of the program payments for Temporary Assistance, Employment, HEAP, and Medical Assistance, and all of the program payments for Foster Care, Adoption Subsidy, Preventive Services, and Day Care. On average we process 10 check runs per month and over 4,600 checks per year. If you are a vendor and need to complete a Taxpayer Identification Form, please click here. You can mail or fax your form to our unit. All monies paid to DSS by or on behalf of a client are received in the Accounting Unit. Revenue from the state or federal governments is received by the Treasurer’s Office and then posted to our accounts by our unit staff. The Accounting Unit staff provides assistance with preparing the DSS budget. We are responsible and accountable for all expenses and revenue included in the budget. Our financial accounts are balanced with the Treasurer’s Office monthly. In addition, we report to a variety of county, state, and federal auditors who inspect the DSS financial and case records. In 2006 the Accounting Unit obtained a scanning system for record retention. Our files and records are now scanned into the system and then shredded. This is saving storage space and we no longer purchase expensive storage boxes. In addition, we have recently started uploading some reports to the scanning system without having them printed. This is saving the amount of paper and toner we use and helping our printer last longer. What is the Coordinated Care Unit? The Coordinated Care Unit is a central entry point for personal care and lifeline home-based services in Essex County and Adult Protective Services. To receive personal care services in your home, a person must be eligible for NYS Medicaid. Adult Protective Services are provided without regard to income. The unit works in cooperation with the Department of Social Services, Essex County Nursing Service, Office for the Aging, North Country Home Services, Mental Health, hospital discharge planners, nursing home/adult home social workers, and Lifeline Systems and North Country Home Services Lifeline Department. Adult Protective Services (APS) is a program for adults 18 or older who may need protective services for a variety of reasons: they have a physical or mental impairment and they are no longer able to protect themselves from neglect, abuse, exploitation, or hazardous situations; or they are unable to provide for their most basic needs of food, clothing, shelter, or medical care; and they have no one willing or able to help them in a responsible manner. Some of the services APS can provide are investigations of requests for help, home visits to identify needs and arrange for services, medical care or other resources in the community, counseling for the person and the family, money management issues, referral to legal services, assistance in finding other living arrangements, services to obtain a guardian, homemaker and housekeeper services in certain cases, and assistance in obtaining other benefits and services. In certain instances we are able to obtain Access Orders and Short-Term Involuntary Protective Services Orders for adults who are at risk of harm and who are not aware of the consequences of their actions. Home care, and if necessary, admission to assisted-living programs, adult homes, skilled-nursing facilities, and mental health facilities. Legal interventions, always starting with the least restrictive. Legal interventions include assisting an individual to find a representative payee for Social Security benefits, finding an individual to act as Power of Attorney, filing for Orders of Protection, or Article 81 proceedings to establish a guardian for the individual. Other community services to meet the individual’s needs. A mental or physical disability. The individual has no one willing or able to responsibly assist. Adult Protective Services are free to all adults regardless of income. Be sure to include the name of the individual you are concerned about, any of the individual’s demographic information you know of, your concerns, and how we can reach you for more information. To receive personal care services NYS Medicaid eligibility is required, in addition to a doctor’s referral, to receive in-home services to assist with normal activities of daily living. What does a Home Care Assessment entail? Complete assessment of your health, social, and housing needs by a Social Services Caseworker and a Community Health Nurse. Information on available programs and services in our County. Referral to appropriate agencies to meet your individual needs and desires. Is there a cost for these services? There is no charge for the initial team assessment, except in instances where it may be billed to insurance or Medicaid. If a Service Plan is developed, the client will be responsible for the costs which are not paid by insurance or Medicaid. You will be fully informed of all costs prior to the initiation of services. If you are not on Medicaid, there is a $175 charge, with a sliding-fee charge available, for the completion of the Private Review Instrument (PRI) form needed for nursing home placement. Personal Care Services require NYS Medicaid eligibility. When should I call the Coordinated Care Unit? If a family member or friend has a need for any home-based services. If you have questions about what is actually available in Essex County, relating to home care services, residential facilities, special care needs, or equipment. If you have any questions or problems with the services that have been arranged for you, or whenever you feel your plan of care is no longer meeting your needs for care at home. For further information on services for the elderly or disabled, please call Essex County Office for the Aging at (518) 873-3695 or click here. Phone (Customer Service Helpline): 1-888-208-4485 Monday through Friday, 8:00 A.M. to 7:00 P.M.
enforce the terms of the Family Court/Supreme Court orders of support. Essex County Child Support office is located at 7551 Court Street, Elizabethtown, NY 12932. Workers are available for walk-ins Monday through Friday 8:00 A.M. to 4:00 P.M., at which time you can come in with questions or to request our services. You may also call the Customer Service Helpline at 1-888-208-4485 Monday through Friday, 8:00 A.M. to 7:00 P.M., or TTY # 1-866-875-9975. The Customer Service Helpline is a call center which can answer general or case-specific information. If they are unable to help you at the call center, a local district referral is created, and you will get a response from your local child support worker. Every phone call at the call center is recorded, and a reference to your call is put on your case record. When calling the helpline, please follow the telephone prompts. If you are ordered to make support payments and want to file a petition or check on a court date, you should call the Essex County Family Court at (518) 873-3320. All child support payments remitted to Essex County (or any county in New York State) should be made payable and mailed to: NYS Child Support Processing Center, PO Box 15363, Albany, NY 12212-5363. For identification purposes, please be sure to include the NYS county and child support case number for all payments remitted. To check on payment amounts, payment dates, or the dates child support checks were mailed, please call the New York State Child Support Information Line at 1-800-846-0773. This line is available 24 hours a day, 7 days a week. You will need your Social Security Number and Personal Identification Number (PIN) to access information. If you do not have a PIN, please call the Customer Service Helpline at 1-888-208-4485 to request one. If you receive support payments and need to change your address or report a lost check, please call the Child Support Customer Service Helpline at 1-888-208-4485. Our mission is to empower and provide supportive and/or rehabilitative services to families with children who are at risk, while ensuring safety and permanence for children. The Children’s Division of the Essex County Department of Social Services is responsible for the provision of Child Protective Services, Foster Care Services, Adoption and Preventive Services. IF YOU SUSPECT CHILD ABUSE OR NEGLECT REPORT IT! Child Protective Services is the only public entity responsible for safeguarding the physical, mental, and emotional well-being of abused and neglected children. CPS receives all reports of suspected child abuse and maltreatment within families and conducts investigations, first to assess the risk of harm to the children and then to examine the allegations of maltreatment in each report. In cases where neglect or abuse exists, CPS provides and arranges for services necessary to ensure that risks to the children’s safety are eliminated as well as work to preserve and stabilize family life whenever possible. To speak to someone in the Essex County Child Protective Unit, please call (518) 873-3404. The Preventive Services Unit provides services to families and children when there is a documented risk to the children of placement in foster care or remaining in foster care without such services. Unless court-ordered services are voluntary and may include parent aide services, homemaker services, transportation, respite, daycare, case management services, and intensive home-based services. Families must meet programmatic eligibility, but services are provided without regard to income. For further information or to make a referral, please call (518) 873-3417. Foster care services are provided to those children ordered into the custody of the Department by Family Court as a result of abuse or neglect proceedings, or as a PINS (person in need of supervision) or JD (juvenile delinquent). Placements are followed with a goal of returning home as soon as safety can be addressed and when services such as counseling, education, health, etc have been effectuated. To speak to someone in the foster care unit please call (518) 873-3419. Foster and adoptive parents are special people who open their hearts and homes to children in our community. The home finder recruits, trains, and certifies foster and adoptive families. If you are interested in making a difference in a child’s life, please call (518) 873-3422. The adoption unit arranges placement of children waiting to be adopted into appropriate homes. They provide support and guidance to the children and the adoptive parents, until the adoption is finalized. Photographs and biographies of the children available for adoption in New York State are available in the New York State Adoption Album. If you are interested in adopting, please call (518) 873-3422 or check out the New York State Office of Children and Family Services website for further information. Day Care Services – Essex County Subsidized Day Care is available for parents and/or caretakers who meet a certain set of requirements while they attend work and/or school. Day Care Assistance is available for persons who are currently receiving Temporary Assistance and are attending a work/training program. Parents and families that are not receiving Family Assistance can qualify on basis of income. Essex County utilizes the New York State income guidelines set at 200% of poverty. If gross income for your appropriate household size is equal to or less than the guide below, you are eligible for Day Care Assistance. Please click here for the eligibility guidelines. All parents/caregivers involved in the Day Care program pay a weekly portion of their day care invoice directly to their children’s provider(s). This payment, called the Parent Share or Parent Fee, is set and based upon the household income. There is no resource limit in determining eligibility for Day Care Assistance. There are 3 easy ways to apply for Day Care Assistance. Check the appropriate box on your Public Assistance application indicating you need Day Care Assistance. Click this link for a downloadable application. Call our Day Care Unit at (518) 873-3431. Copy of birth certificate(s) for the child/children. Income verification for last 4 weeks. * If special circumstances, please contact (518) 873-3431 to discuss alternatives. Having both facilities and homes for our children to receive care while parents/caretakers attend work or school is essential for the Day Care program and continuing success for residents of Essex County. If you are interested in becoming a day care provider, please contact either the Day Care Unit (518) 873-3431 or Adirondack Community Action Program (518) 873-3207. For more information please visit the Office of Children and Family Services website. Applications to become a provider can be found here (English PDF) or here (Spanish PDF), as well as the Vendor Tax Identification Number Form that you will need to complete. Public Assistance programs like Medicaid are a vital source of help for many Essex County residents who need and deserve assistance. Unfortunately, there are those who take advantage of these programs and the people they serve by intentionally obtaining money and services, for which, they are not entitled. WHAT IS PUBLIC ASSISTANCE FRAUD AND ABUSE? Fraud and abuse are any intentional actions that result in a recipient or provider receiving benefits or payments to which they are not entitled. Medicaid and Public Assistance fraud is a serious crime that can result in imprisonment, probation, civil penalties, restitution and can render someone ineligible for benefits for a certain length of time. Giving your EBT card to another in exchange for money, a controlled substance, or for the purpose of committing an unlawful act (Trafficking). Providing false or incomplete information to the Department of Social Services at either the application or the recertification phase. Falsely reporting that a parent is absent from the household. Falsely reporting that a child is in the household. Listing a non-relative as a family member in order to obtain benefits. Intentionally failing to report a change in the household composition. Intentionally failing to report earnings from employment or monies received from unemployment, disability or social security. Intentionally failing to disclose assets, including bank accounts and real estate. Submitting false or fraudulent documents to the Department of Social Services in order to get benefits. Using someone else’s benefits card to obtain treatment, services or benefits. Claiming coverage for treatments, services or supplies not received. Forging or altering a prescription. “Doctor Shopping” to obtain unnecessary prescription medications or durable medical equipment and then selling these items for a profit. Types of Providers: Includes physicians, dentists, pharmacists, home care providers, mental health providers, durable medical equipment suppliers, ambulance companies, medical transportation companies, hospitals, nursing homes and day care providers. Billing for nonexistent or unnecessary medical services, such as x-rays, laboratory tests or drugs that were never dispensed. Billing for more expensive products or labor-intensive services than were provided. Paying kickbacks or providing gifts and other incentives to third parties in exchange for business or referrals to a particular doctor or hospital. Inflating of claimed mileage by transportation companies in order to receive greater reimbursement. Billing Medicaid for transportation to non-Medicaid services. Billing an insurance carrier or patient for the cost of a name brand prescription when a lower costing generic substitute or an over-the-counter drug was instead supplied. Deliberately applying for duplicate reimbursement – “double billing”. Billing for more days in a hospital or nursing home than the patient actually stayed. Billing services for patients who have died. Billing related services separately to charge a higher amount than if services were combined and billed as one service. Billing for used items as new items by durable medical equipment companies. Continuing to send recipients medical supplies when it is no longer medically necessary. WHAT IS ESSEX COUNTY DOING TO HELP COMBAT FRAUD AND ABUSE? Essex County is committed to protecting the quality and integrity of the County’s Public Assistance Programs. Our Fraud Investigations Unit is actively pursuing fraud and abuse throughout the various programs offered within our County. Our Fraud Department works closely in conjunction with the Essex County Sheriff’s Office and the Essex County District Attorney’s Office to detect, prevent and deter fraud and abuse within Essex County. As a team, they work to prosecute those individuals and providers who defraud or abuse the assistance system. Public assistance programs, like Medicaid, Temporary Assistance, Food Stamps, Day Care and HEAP are all vital resources for many of our residents. However, waste, fraud, and abuse in these programs can cost YOU millions of taxpayer dollars each year and shortchange those who actually need and deserve our help. Please help us fight those who defraud and abuse these programs. If you know of any provider, business or person engaged in questionable practices involving public assistance programs, let us know. Working together, we can make a difference. (518) 873-3636 or (518) 873-3638. IF YOU KNOW SOMETHING, SAY SOMETHING! AFTER HOURS EMERGENCY CALLS (ONLY FOR IMMEDIATE EMERGENCIES THAT CAN NOT WAIT UNTIL THE NEXT BUSINESS DAY): The number to call during non-business hours is the Sheriff’s Department 873-6321. If a delivery is authorized, you will be required to apply for HEAP. HEAP is a federally funded home energy assistance program intended to assist low-income households in meeting their energy expenses. HEAP may also assist with heating equipment and repair for eligible households. In Essex County, the Department of Social Services HEAP Department administers the program. ELIGIBILTY for the HEAP program is based on gross income, the size of the household, and heating situation. Households that are responsible for their own heating costs and households that have the heating costs included in the rent may be eligible for the HEAP program. The program start date is on or about the first Monday in November and the program will run until funding is exhausted. REGULAR HEAP is a one time program year benefit based on gross income, household composition, energy costs and type of heating situation. There is no resource level for Regular HEAP. EMERGENCY HEAP benefits are available to people who have heating or heat-related emergencies such as less than ¼ tank of fuel / propane, less than 10 days supply of wood, wood pellets or coal, or have a shut-off notice from their electric company. Liquid resources are considered when determining eligibility for Emergency HEAP. HEATING EQUIPMENT REPAIR / REPLACEMENT benefits are available to eligible homeowners who are in an emergency situation due to a malfunctioning heating system. The residence must be the PRIMARY residence of the homeowner. All resources will be explored when applying for this benefit. Food Stamp and Temporary Assistance recipients MAY receive HEAP automatically through their Food Stamp / Temporary Assistance case and are notified when the payment is sent. Questions may be directed to your worker or call the HEAP Department at 873-3878 or 873-3446. Applicants who received HEAP during the last heating season AND have a vulnerable member in the household (person under 6, over 60, or in receipt of Social Security Disability / SSI) should receive an application by mail. Applications are usually mailed out by the end of November. All applicants who are over 60, but NOT receiving Food Stamps or Temporary Assistance may apply by mail. Please contact the Office for the Aging at 873-3695. All applicants who are over 60 AND receive Food Stamps or Temporary Assistance should contact their worker or the HEAP department at 873-3878 or 873-3446 if they have not been notified of their benefit by the middle of December. Applicants who received HEAP during the last heating season and DO NOT have a vulnerable member in the household (person under 6, over 60, or in receipt of Social Security Disability / SSI), can apply by mail and should call 873-3878 or 873-3446 for an application. First time applicants will need to apply in person and may call 873-3878 or 873-3446 for appointment. Though scheduled appointments are seen first, walk-ins are welcome. The Medicaid Unit processes applications for a variety of health insurance programs including Medicaid, Medicaid Managed Care, Family Health Plus (FHP), and Prenatal Care Assistance Program (PCAP). Family Planning Benefits Program (FPBP), Medicaid Buy-In for Working People with Disabilities (MBI-WPD), and the Medicare Savings Program (MSP). Financial eligibility is determined based on the income and resource standards governing the Health Insurance Programs. A Supplemental Security Income recipient is granted Medicaid based on his/her certification for SSI benefits. A separate application for Medicaid is not needed for SSI recipients. Persons eligible for Medicaid may be required to enroll in a managed care plan. Essex County became a mandatory managed care county in October of 2010. At this time Essex County has 2 plans. The plans are Fidelis Care NY and United Healthcare. EFFECTIVE 1/1/14 If you are in one of these categories you must apply with the NY State of Health. Persons over the age of 65 who wish to apply for Medicaid must request an application from our office. An application can be requested by calling (518) 873-3441. An application packet will be sent to you. Complete the application form and return it to us. Effective 4/1/10 a face-to-face interview is no longer required. We will offer application assistance at our office Monday – Friday 8:00 – 3:00 on a first-come first-served basis. Completed applications can be mailed in, and if other documentation is needed a Social Services worker will follow-up by phone or mail. You may request a certain time for application assistance by contacting our receptionist at 518-873-3441. When an application is received by mail or in person it will be reviewed. If additional documentation is required you will receive a letter which will list what information is needed in order to complete your application. You will have 10-15 days to supply this documentation. We may call if there are additional questions regarding the application. Applications for the Medicare Savings Programs may be obtained by calling (518) 873-3441. A face-to-face interview is not required and the process can be completed by mail. Depending on your circumstances you may be asked to verify all your resources, including but not limited to bank accounts, trust funds, insurance, CDs, burial accounts, burial spaces, vehicles, and property, Medicare and other health insurance cards, and verification of premium cost. After all the necessary documentation needed to determine eligibility has been received, a decision will be rendered by the Medicaid office and a formal written notice will be mailed to the applicant and to their representative. If the applicant does not agree with the written decision, the notice includes information on how to apply for a fair hearing through the New York State Department of Health. If you are found eligible for ongoing Medicaid or another health insurance program, you will be required to re-establish your eligibility at regular intervals as determined by the New York State Social Welfare law. This is called a “recertification”. You will receive notification of your recertification and a renewal form by mail. It must be retuned by the date in the notice for your benefits to continue. Social Services law requires that you report any changes in your income, resources, family composition and residence to the Medicaid office. You may also be contacted by the department if a computer income match indicates a change in your circumstances. If you have any questions, you may contact the Medicaid Community Unit at (518) 873-3450. THE MEDICAID CHRONIC CARE UNIT processes Medicaid applications for those individuals who are seeking assistance in paying for nursing home care. Financial eligibility is determined based on the income and resource standards governing the Medicaid program. A Supplemental Security Income recipient is granted Medicaid based upon his/her certification for SSI benefits. The amount of assistance that the Medicaid program will pay toward the cost of nursing home and/or home care services is determined using a comparison of the available income and resources of the applicant against the cost of the medical services needed. Since each financial and medical circumstance is unique, the regulations and policies governing what assets are exempt and what assets are used in the determination of eligibility vary; therefore, income and resource standards are not listed here. Anyone who needs financial assistance in paying for nursing home or long term home health care services is encouraged to contact our office for consultation regarding their specific need for benefits. In Essex County, if you need to apply for Medicaid for a person who is already in a hospital, nursing home, or receiving services from a home care provider, someone on the staff of one of these organizations usually can assist you with obtaining an application for Medicaid. If they cannot assist you, you can call the Medicaid Chronic Care office to request an application. An application can be requested by calling (518) 873-3441. An application packet will be sent to you. Complete the application form and return it to us. You will be asked questions regarding the income and resources of the person who is in need of Medicaid benefits. From those questions, a list of required documents that must be provided to determine eligibility will also be given along with the application. These documents should be submitted with the application. The agency can accept legible photocopies, but if originals are provided they will be copied and returned. Effective 4/1/10 a face-to-face interview is no longer required. We will offer application assistance at our office Monday – Friday 8:00 – 3:00 on a first-come first-served basis. Completed applications can be mailed in, and if other documentation is needed a Social Services worker will follow-up by phone or mail. You may request a certain time for application assistance by contacting our receptionist at 518-873-3441. The law requires that you provide documentation to verify your sources of income, your assets, birth date, marital status, and citizenship, as well as some other items. Below is a list of some of the items that will be required. Note: other items may be requested based on other circumstances. You will receive a detailed list when you receive the application to complete. Verification of ALL sources of income for the applicant and the spouse, such as but not limited to, wages, social security, pensions, veterans and military benefits, interest and dividend income. The gross amounts must be verified, with all deductions, and the frequency with which the income is received. Verification of ALL the assets of both the applicant and spouse MUST be documented. If you are seeking nursing home services, account statements for all accounts currently active and those that were active within the last 60 months prior to the date of application must be provided. If the applicant or spouse set up a trust or are the beneficiaries of a trust, the trust document must be provided and all assets owned by the trust must be documented for the 60 months prior to the date of application. Examples of some types of assets that must be documented are (but not limited to) checking and savings accounts, CDs, stocks, bonds, mutual funds, retirement funds, annuities, life insurance policies, burial spaces, burial funds, all properties owned, vehicles, mobile homes and RVs. The application, as well as the necessary documentation, will be reviewed in detail. If, as a result of that review, there are more documents required to determine eligibility, a list of these outstanding documents will be given or sent to you, and a length of time, usually two weeks, will be given to provide them. This is called the “pending period”. If you cannot obtain the required documentation within the time frame given by the agency, you can request an extension of time which will be granted only if the agency feels there is justification that additional time is necessary. After all the necessary documentation needed to determine Medicaid eligibility has been provided, a decision will be rendered by the Medicaid Office and a formal written notice will be mailed to the applicant, their representative, and the facility or home care provider involved. If you are found eligible for ongoing Medicaid benefits, you will be required to re-establish your eligibility at regular intervals as determined by the Department. This is called “recertification”. You will receive notification in the mail of how to complete your recertification and the date that your recertification must be completed. If you have any questions, you may contact the Medicaid Chronic Care Unit at (518) 873-3450. This is a federally funded supplemental program which issues monthly benefits. SNAP benefits are used to purchase food items and are redeemed when you use your electronic benefit card. Most food stores accept the CBIC/EBT card. Look for the Quest sign on the door or window of the store. Applications are available at your local Social Services Department in person, by mail, or via the internet. You may download and print a SNAP benefits application at http://otda.ny.gov/programs/applications/4826.pdf. Note: if you have access to the Internet, find out if you may be eligible for SNAP benefits and other work supports by visiting www.myBenefits.ny.gov. If everyone in your household is applying for or getting Supplemental Security Income (SSI), you can also apply at your local Social Security Administration Office. Once a completed and signed application is received by the Agency, an appointment is scheduled. If you are employed or disabled, you may request a telephone interview. New York State has now made it easier for working families to apply. Effective January 1, 2008 the Working Families Food Stamp Initiative (WFFSI) became effective. WFFSI households will not be required to complete a face to face interview or be required to be finger imaged. Eligibility for SNAP benefits is based on household size, income, resources, and shelter expenses. Children under the age of 22 living with their parents are not eligible for SNAP benefits on their own. They would need to apply as a household. If your household has little or no income and needs help right away, you may qualify for “expedited SNAP benefits”. All applications are screened by the receptionist upon receipt to determine if expedite eligible and/or WFFSI eligible. Please note: Books 1, 2 and 3 are included with all applications. These books tell you in many ways how your local Department of Social Services may be able to help if you or your family is in need. Please remember that these programs or services have Federal or State rules that must be followed. Mission StatementTo develop and coordinate a comprehensive DWI counter-measure program to deter the incidence of drunk driving and the occurrence of alcohol-related traffic injuries and fatalities.Program DescriptionSTOP-DWI stands for “Special Traffic Options Program for Driving While Intoxicated”. The STOP-DWI Program was enacted by the State Legislature in 1981 for the purposes of empowering county governments to coordinate local efforts to reduce alcohol and other drug-related traffic crashes within the context of a comprehensive and financially self-sustaining alcohol and highway safety program. Temporary Assistance is the term used in New York State for public assistance (welfare) programs. Temporary Assistance provides families and individuals with short-term help while they work toward self-sufficiency. This program provides money for families with children. Cash benefits are limited to five years in a recipient’s lifetime. After five years a Family Assistance case may continue to receive benefits if an adult is disabled and cannot work or may be required to apply for assistance through the Safety Net category. This program provides money for basic living expenses for single adults and childless couples or families who have used up their 5-year limit of FA. Cash benefits are limited to two years including any cash benefits received through Family Assistance. After two years, the non-cash Safety Net Assistance voucher system provides benefits. An emergency is an urgent need or situation that has to be taken care of right away. Emergency Assistance for Families (EAF), Emergency Assistance for Adults (EAA), and Emergency Safety Net Assistance (ESNA) provide assistance for crisis situations. Services such as prevention of evictions, moving expenses, utility shutoffs, help with food expenses and diversion payments to help individuals avoid the need for ongoing assistance are available. You have little or no food. Your landlord has given you a written eviction. You or someone in your family has been beaten, abused or threatened with violence by a husband, wife, partner or other member of the household. Applications are given in person or through the mail upon request from the receptionist by calling 873-3441. Once a completed signed application is received, an appointment for an interview is scheduled at the DSS building in Elizabethtown. Interviews take approximately 1 hour or more to discuss and obtain documentation which allows eligibility to be determined. Applicants are subject to income and resource limit guidelines. Benefits vary depending on household size, available income and household expenses. The Traffic Safety Program is a comprehensive program designed to help reduce and prevent traffic related injuries and fatalities in our community. These programs and services are provided to the residents of Essex County at “no cost” to the taxpayer. Complete funding support is received from the New York State Governor’s Traffic Safety Committee through a grant award process. Without the Essex County Traffic Safety department, local police agencies and county departments would not qualify for the available G.T.S.C. grants. Highway Safety Grant: GTSC provides funding to the Essex County Traffic Safety office to help support our efforts to reduce the number of crashes, injuries and deaths on our county roadways. This funding helps our office provide educational opportunities to the residents of Essex County through media materials and events such as bicycle rodeos. It also provides funding for bicycle helmets to be distributed to the youth of our county. Child Passenger Safety Grant: our Child Passenger Safety program provides education on the proper use and installation of child safety restraints. 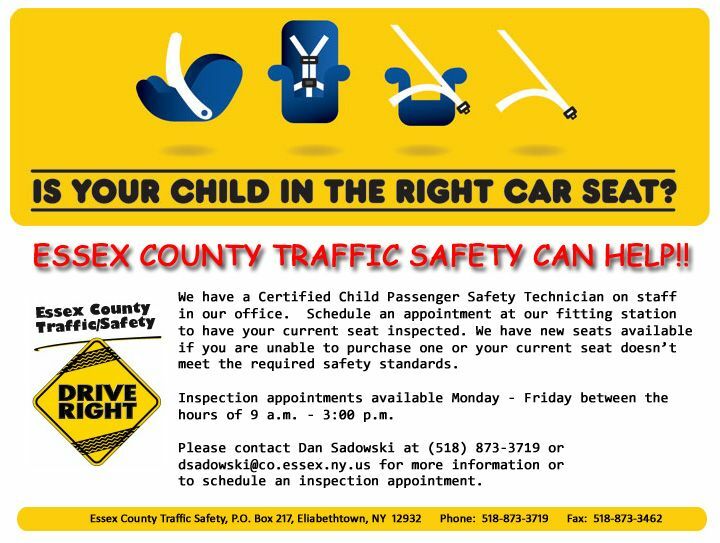 The Essex County Traffic Safety office has certified child passenger safety technicians that are trained to install car seats, and to instruct caregivers how to properly install their child’s seats. This program also provides funding to purchase new child restraints to be distributed to county residents that otherwise couldn’t afford to purchase a new restraint. These new safety seats are distributed to residents of Essex County through fitting station appointments and local child passenger safety seat check events held throughout the county. For more information on our Child Passenger Safety Seat program, or to have your child’s seat inspected, please contact the Traffic Safety office at 518-873-3630. Selective Traffic Enforcement Program (STEP) Grant: Essex County Traffic Safety provides funding to the Essex County Sheriff’s Department to help offset the costs of enforcing existing traffic laws put in place to combat the issues of aggressive driving, distracted driving, and speeding. This funding allows for an increased number of STEP patrols throughout the year. Essex County is a geographic behemoth, and it is the second largest county in New York State. Essex County features 18 distinct and unique communities. Essex County is replete with bucolic splendor and pristine lakes and rivers. Essex County is New York State’s recreational playground. Delivering services to county residents requires a substantial involvement by communities. This comprehensive approach allows for broad participation by persons of every age, and from every community perspective. The Essex County Youth Bureau is a uniquely-positioned agency, in that the Youth Bureau is concerned with all Essex County youth. The Essex County Youth Bureau welcomes any Essex County resident to participate in the planning, funding and delivery of youth services. The Essex County Youth Bureau conducts a variety of measurement activities over the planning cycle. These activities include conducting county-wide surveys such as the Youth Risk Behavior Survey, The Communities That Care Survey, and The Prevention Needs Assessment Survey. These surveys establish the level of risk-taking behaviors by Essex County Youth. Areas of measurement include underage drinking, binge drinking, tobacco use, and illicit drug use, to mention just a few priority domains. Our survey work also informs us of the good things that young people are encountering, and not just the difficulties that they are experiencing. The Youth Bureau conducts a recreation survey series during the summer recreation season that features three elements. The camper survey measures camper satisfaction with the program, and measures the skill sets that campers acquired during camp. The recreation counselor survey measures program effectiveness and key developmental knowledge regarding youth and related Youth Bureau training effectiveness. The director survey seeks to harvest the experiential knowledge that experienced directors possess, and asks directors what they would suggest to improve Youth Bureau trainings and technical assistance. The Youth Bureau monitors all direct and indirect service programs to ensure program compliance. Youth Bureau staff perform on-site evaluations during the program monitoring phase. These observations and evaluations assist the Youth Bureau in determining program effectiveness, funding priorities, and best practices. The Youth Bureau completes the needs assessment process, and then seeks youth programs to address identified needs and priorities. The Youth Bureau issues requests for proposals (RFPs) throughout the county, for consideration by local service providers. Program providers submit proposals that are evaluated by the Essex County Youth Bureau and Youth Planning Board. Funding decisions and local priorities are selected by the Youth Bureau Planning Board that respond to priorities identified in the needs assessment. 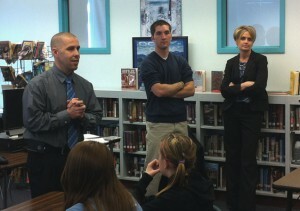 Photo: A presentation that Mike Mascarenas (Director of Community Resources), Kristy Sprague (Essex County District Attorney) and Brody Hooper (Elizabethtown Central School Junior and ER Technician at ECH) did for the students of Willsboro Central School on the dangers of K2 and underage drinking on April 4th, 2012. For more information please contact Community Resources at 518-873-3630. This program is offered in various towns to provide employment, vocational and job skills to area youth. This program is sponsored in part by the Ticonderoga Festival Guild, Inc. The program promotes, develops, sustains, delivers, and advances the performing arts in the Ticonderoga area. Since 1983, the Guild has presented programs that fulfill this mission in regards to area youth and children. Youth programs in Essex County are informed and invited to the programs. Bus loads come from Summer Youth Programs. The Arts Trek performance takes place each Wednesday morning, starting in July. The Schroon Summer Enrichment Program was developed to help those students with exceptional needs not necessarily met during the regular school year, or identified needs that can be met with continuing instruction. The Thomas Shipman Sr. Memorial Youth Center is located in the Town of North Elba. The center is open to youth ages 11-18. The center provided planned activities to increase self-esteem as well as cultural, educational, and recreational experiences. The Summer Food Service Program was established to ensure that children continue to receive nutritious meals when school is not in session. Free meals are provided to all children at approved sites in areas with significant concentrations of low income children. The Youth Bureau operates two types of sites, open sites and closed enrolled sites in various towns in Essex County. Sites must meet the criteria for closed enrolled or open to qualify.